This Burmese-style curried noodle soup is spicy, rich and filling. It's also quick and easy to throw together. Heat the curry paste in a large saucepan over a medium heat. Add the chicken drumsticks and cook for 3-4 minutes on all sides, or until covered in the curry paste and browned all over. Boil 200g/7oz of the noodles in a large pan of boiling water for no more than 1 minute. Drain well and set aside. Heat the groundnut oil in a wok over a high heat. Add the remaining noodles and fry for a few seconds, until crisp. Divide the blanched noodles among 3 or 4 serving bowls and splash a little soy sauce over each. Pour over the chicken and sauce, then sprinkle the spring onions, red onion and coriander on top. 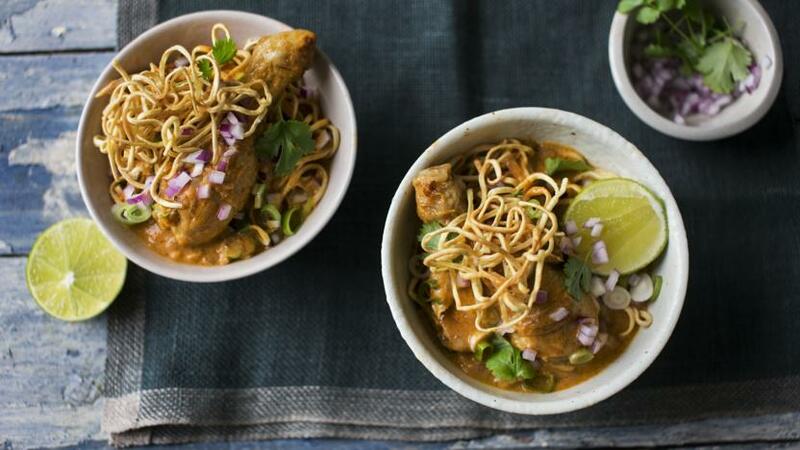 Break the fried noodles into small pieces and sprinkle them over each bowl of khao soi. Serve with lime wedges alongside.